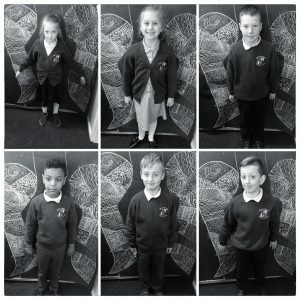 Working with images and pictures is something we do often in Year 3 and 4 at North Ormesby Primary Academy. There are a high proportion of EAL children within the cohort so working with images makes learning accessible for all. 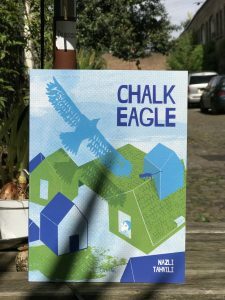 We first introduced the wordless picture book, Chalk Eagle, through stand alone images. We used snapshots from the book during grammar sessions (as we often do with other images from sites such as Once Upon a Picture or Pobble365). The children were immediately engaged by the images from Chalk Eagle and began to infer various things about the images ‘who is the boy? Is that a real eagle? Why is the boy drawn with a white outline?’ It was at this point that we shared the entire story with the children. We have previously used wordless picture books in school and so the children are familiar with ‘reading’ from wordless picture books. We took it in turns to ‘read’ the book with children giving a variety of narratives and explanations for different elements of the story (the boy is dreaming, the boy wants to escape his urban life, it might not be his imagination- it might be real). The children were then given an informal opportunity to discuss the book further. This child led dialogue enabled the children to take ownership of the story and project. Whilst listening to the children’s discussions, I noticed a lot of them were captivated by the idea of wings and the boy within the story flying on the eagle and exploring. This inevitably led the children to link this to their own lives and experiences ‘if I could fly I would…’. It was this concept that led to our final piece of artwork. 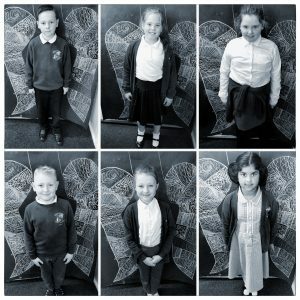 The children were all given a section of wing. Naturally, we completed the artwork using chalk (as the boy in the story had). 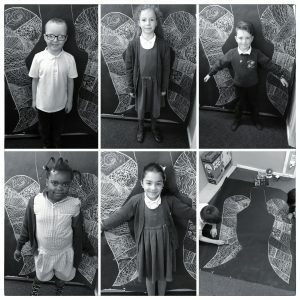 The children did some research and looked at images of wings, doodling within a wing outline and chalk art. This inspired each child to contribute to our final piece. 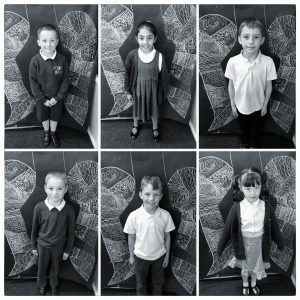 The children were all desperate to stand in front of the wings, imagining they were flying (just like the main character in Chalk Eagle) and have their picture taken. Having the wordless picture book within the classroom really enabled a child led and open ended project. The children ultimately took ownership and through their enthusiasm, created the fantastic piece that they have.